A group of Spanish astronomers using the Liverpool and Mercator Telescopes at the Observatorio del Roque de los Muchachos have recently reported the discovery of a binary star system comprising a Be-type star and, remarkably, a black hole. 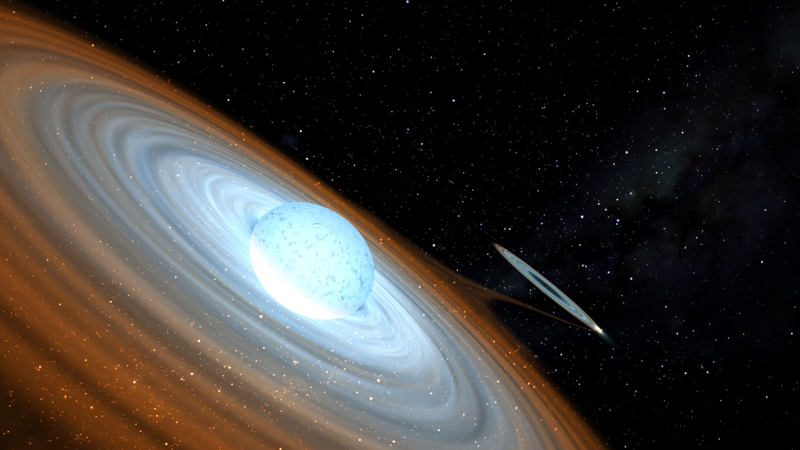 Artists impression of a Be star spinning at extreme velocities and depositing matter onto its binary companion, a black hole, seen here in the background. Image credit: Gabriel Perez - SMM (IAC). Jorge Casares of the Instituto de Astrofisica de Canarias (IAC) and La Laguna University (ULL) is lead author on a paper1, recently published in the science journal Nature, in which he and his colleagues present their exciting results. Be-type stars are known to be fast rotators, and many find themselves to be one-half of an interacting binary system. However, their companions are usually neutron stars. This is the first time that the object orbiting the Be star has been identified as a black hole. The newly-discovered system is located in the constellation Lacerta (the Lizard), at a distance of about 8,500 light years from the Earth. Known as MWC 656, the Be star rotates with an angular velocity of more than 1 million kilometres per hour. At this speed the star is close to being ripped apart by centrifugal forces, and is ejecting matter through an equatorial disk towards its mysterious companion. Casares' new spectroscopic observations indicate that this companion is a black hole. A detailed analysis of the spectrum of MWC 656 suggests that its companion has a mass somewhere between 3.8 and 6.9 times that of the sun. Such an object is too massive to be a neutron star, and can only be a black hole. Matter is transferred from the Be star, though its equatorial disk, down onto the black hole via a second disk (an "accretion disk"). By analysing the emission from this second disk Casares and his team were able to measure the mass of the black hole. In all likelihood, binary systems comprising Be-type stars and black holes are far more common than previously thought. Even so, it is notable that such a discovery was made using two relatively modest-sized telescopes, the 2.0 meter LT and the 1.2 meter Mercator telescope. 1Casares J., Negueruela I., Ribo M., Ribas I., Paredes J.M., Herrero A., Simon-Diaz S., 2014, Nature, 505, 378 [links: Nature | Astro-ph ]. 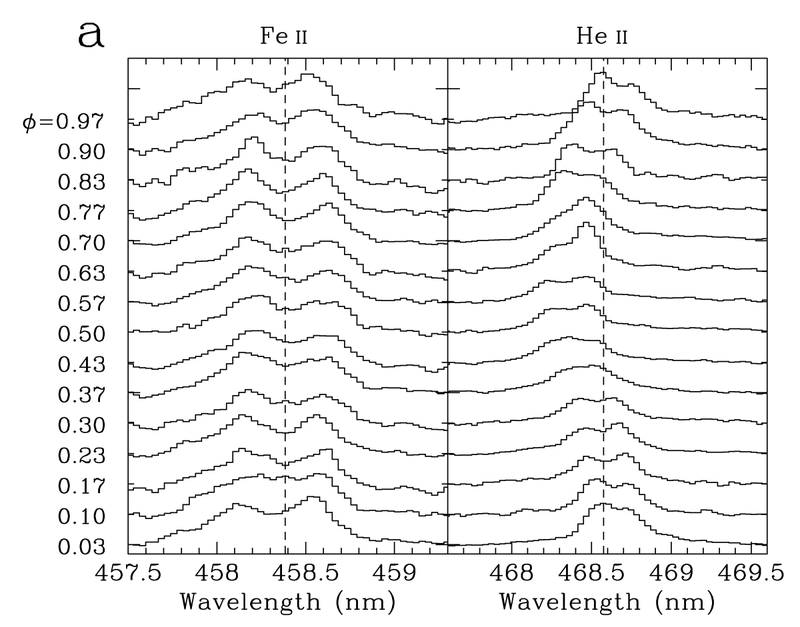 Spectroscopic observations obtained with FRODOspec on the Liverpool Telescope showing the orbital evolution of emission lines from ionised Iron (Fe) and ionised Helium (He) atoms: (a) a sequence of spectra showing the change in line profile shape through one orbital phase; the vertical dashed line indicates the rest wavelength of each transition. 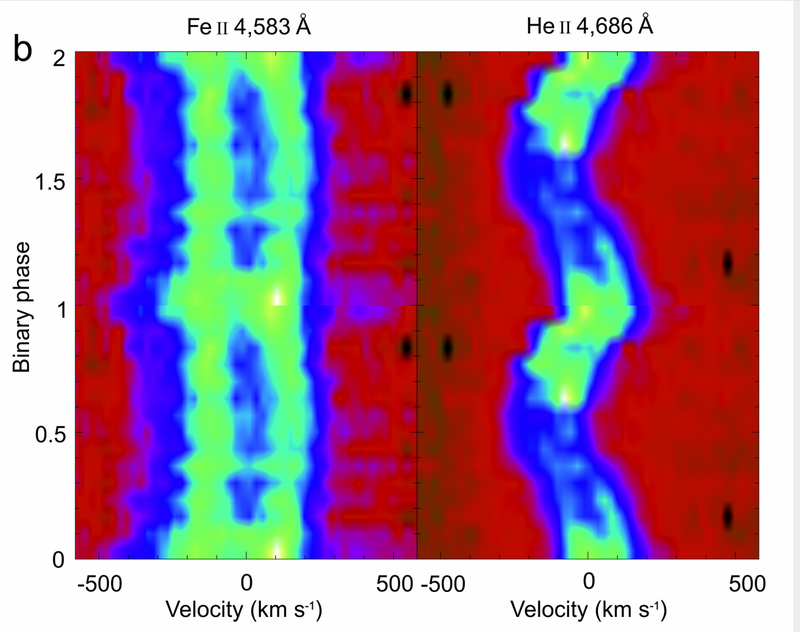 (b) trailed intensity images of the same two emission lines plotted across two orbital cycles. See paper [ Nature | Astro-ph ] for further details.